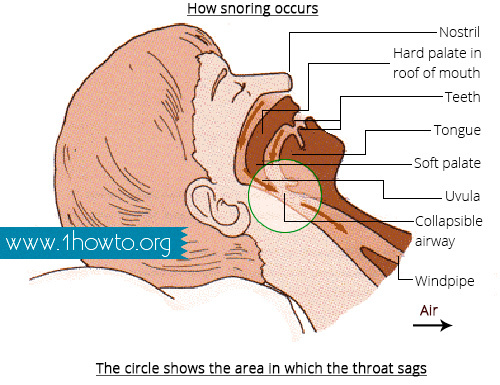 Jun 15, 2013 Snoring1 is a common illness, affecting about 40% of men and 25% of women. People, suffering from snoring, make snorting and raspy sounds while breathing in their sleep. And this is a big problem not only for those who snore, but also for their relatives and friends. If you have decided to stop snoring, this article will help you to achieve the object. It will be easier for you to overcome snoring if you know what can cause it. First of all, people snore for various reasons, and you should find out which one makes you snore. It can be sleeping on the back, old age, problems with throat muscles, blockage of nasal passage, alcohol, pregnancy, smoking, sedatives, substantial meals, excess weight, etc. At worst, snoring can be a symptom of some disease. How Is Snoring Sound Created? As a rule, snoring people have much nasal or throat tissue. The airway becomes narrow, which prevents smooth breathing, and the tissue starts vibrating. This creates snoring sound. Sometimes the reason of difficulties with breathing lies in your tongue's position or sleep posture. Anyway, in most cases one can get rid of snoring. Try the following tips if you are tired of snoring. Tranquilizers and alcohol depress the central nervous system. Muscles of jaw and throat relax and snoring becomes more probable. More than that, they can lead to sleep apnea, especially if taken together. Do not use alcohol or sleeping pills for helping yourself to fall asleep without consulting your doctor. It can be very dangerous. Sleeping on your back increases possibility of snoring because such a position loosens throat muscles and blocks the airway. You can prevent sleeping on your back with the help of a small rubber ball (like those used in tennis). Put it into a sock and pin it to the back of the undershirt. While asleep you will feel uncomfortable every time when you lie on your back. A chronic respiratory allergy can be a reason of snoring because it makes people breathe through mouths. Before you go to bed, take an antihistamine3 (first consult a doctor) and clear your nose by a saline spray. Excess fat around your neck pressures the airway and make it partly collapse. Very often it causes snoring. If you lose a bit of that tissue, it can help to get rid of the problem. Never eat rich before going to bed. Your full stomach will push against the diaphragm4. It will be difficult for you to breathe and you can start snoring. This harmful habit damages your respiratory system, irritating throat and nose membranes. It blocks the airway and makes you snore. There are special antisnoring devices, called mouth guards that hold teeth together preventing relaxation of jaw muscles which, as you already know, can be the reason of snoring. If you raise your head slightly, it will help to decrease the pressure on the airway, and you will breathe easier. You should elevate the upper part of your body and not only the head. It can be achieved with pillows. Dry air irritates throat and nose membranes5. Keep it moist with the help of a humidifier. If you start snoring being pregnant, see you doctor and talk with him about it. It can be caused by your increased weight and relaxation of muscles due to hormonal changes. The problem is that your baby can lack oxygen because of your snoring. The following exercises, practiced for half an hour once a day, can help you to reduce or even stop snoring. They will strengthen muscles of your upper respiratory tract. Repeat vowels "a", "i", "e", "u", and "o" aloud for a couple of minutes. Do it several times a day. Close the mouth and pout your lips. You should hold them for half a minute. Touch the top front teeth with the tip of the tongue and then slide it backwards. Do it during three minutes once a day. Open your mouth, move your jaw to the left, hold it for half a minute, and repeat the exercise on the left side. Doctors say that singing can reduce snoring if the reason lies in weak muscles. We hope this article will help you to stop snoring.